Five college students find themselves trapped in a mysterious experiment. There is a certain pleasure to be had in watching bad movies. There are entire social groups and festivals built up around the idea that a bad movie holds a certain charm that can be embraced and enjoyed. I can enjoy many films on this level but the secret is that those films must have a sense of the absurd in them, be ‘in on the joke’ and almost revel in the awfulness. The Control Group does not do these things. It’s just a bad movie. First the synopsis – Five college students wake up in a facility with no idea how or why they got there. Strange things are afoot with bleeding walls, exits that brick themselves up and doorknobs that freeze for no reason. Stuck searching for answers are Jack (Ross Destiche), bickering Vanessa and her insufferable boyfriend Grant, nice guy Corey and manic pixie girl Jamie – a character who is never once believable. So far so simple right? They must band together to make it out of this possibly haunted place that someone has mysteriously placed them in. A neat little survival story about trust and working together with lots of opportunities for creep and character development. But no, writer/director Peter Hurd and writer Logan Gion obviously decided to up the ante by adding more story than you can poke a stick at. Here comes Anne (Emily Soto) the friendly ghost with the most whiny and annoying voice I’ve yet heard on film; if anything she detracts from the ‘horror’. Next we have men in military garb explaining this is all part of an experimental drug trial done in secret but clearly sparing no expense or man power by evil Dr Broward (Brad Dourif of Deadwood, Childs Play, Lord of the Rings etc fame – yes I’m as shocked to see him here as you!). And finally we have some guff about teleportation devices and other realms and serial killers. Grant as the boyfriend becomes much more fun once he’s undead but I have entirely no idea how or why that happens; the script is just all over the place. This is all essentially too much story and none of it done well. There are some themes here that they obviously wanted to explore but nothing is delved into properly or deeply enough to leave much of an impression. Though they use the word ‘trust’ a lot and evidently want to say something about it, just peppering the script with the word is not enough; a good film-maker will use their story in a less heavy handed and more concise way to get their message across. The effects are simply dreadful, and even the blood looks like tomato soup. Some of the ideas behind the gore are good though and even when the characters' motivations are almost gob smacking in their ludicrousness (wet suit guy I’m looking at you!) the torture scene and subsequent ‘bendy death’ scene are okay. Female characters have always been relatively good in horror and in fact one of my favorite things about horror is the close-to-equality that exists in roles; but it seems these writers don’t know how to write for women and so the female characters all come off as bad tropes – what a shame. Also a shame is the fact that Ross Destiche is actually really great in this; he deserved much better material and I hope we see more of him. For a bad film to work as entertainment it should not be as convoluted and hard to follow as this mess of a script, and it certainly shouldn’t take itself so seriously. Some levity is needed here. Without it, this is just a fail. 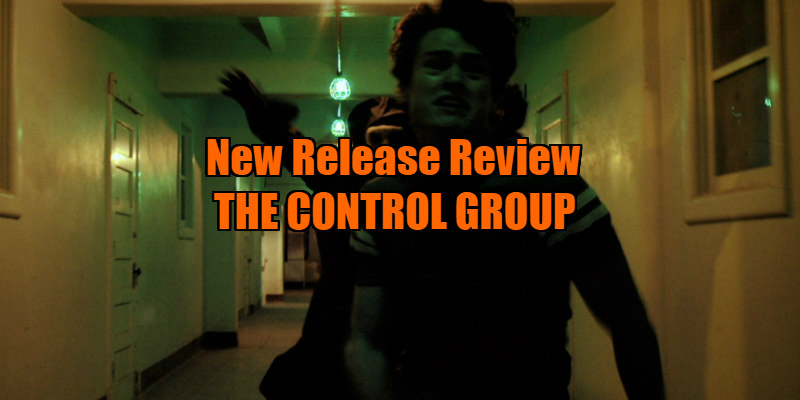 The Control Group is available on DVD May 9th.